Leap into the fascinating world of physical computing! Arduino is no ordinary circuit board. Whether you're a designer, a programmer, or a hobbyist, Arduino lets you learn about and play with electronics. You'll discover how to build a variety of circuits that can sense or control real-world objects, prototype your own product, and even create interactive artwork. 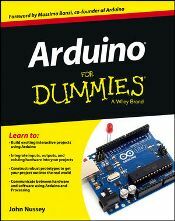 This handy guide is exactly what you need to build your own Arduino project — what you make is up to you!